Release Date: September 7th, 2007 (Quad Cinema) by First Run Features. BASIC PREMISE: A documentary about the reaction to The Wehrmacht Exhibition, which displayed visual proof of the horrific crimes that German soldiers committed during the Holocaust. ENTERTAINMENT VALUE: When The Wehrmacht Exhibition toured German cities between 1999 and 2004, it plenty of controversy as large crowds filled with some ignorant and angry people came to see what their ancestors really did during World War II. Director Michael Verhoeven provocatively captures these diverse reactions to create the big picture of how difficult it is for Germans to accept the truth. One particular member of the crowd claims that he’s not happy that the exhibit labels the entire German army as criminals rather than part of it. To many Germans, the exhibited images of soldiers torturing and shooting innocent civilians as well as laughing while Jews dangle in nooses in front of them, felt very shocking. What’s even more shocking and frustrating, though, is that an angry crowd claims that the photographs were edited and must be fake. Verhoeven tries to interview them to hear their explanation, but they don’t allow it. Fortunately, he manages to include compelling interviews with a variety of experts, ranging from historians, war veterans and journalists who not only react to the images, but analyze what makes it so controversial and important—with the exception of one so-called “expert” who claims that it makes no sense that Hitler brainwashed could have brainwashed the entire German army to kill Jews. 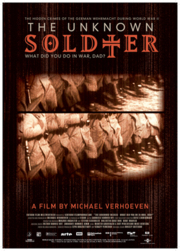 The Unknown Soldier sheds a strong light on the truth that should never be forgotten and, based on the horrifying, graphic images in The Wehrmacht Exhibition, it should not be denied. SPIRITUAL VALUE: The truth, no matter how harsh it may be, is important to express and discuss. Even those who deny that the German soldiers participated in such crimes during WWII, they know deep down inside that it’s true. However, they’re just not willing to accept it yet because they think by labeling their ancestors as criminals, that it automatically makes them criminals too. It’s quite moving to watch those who do accept the truth and maturely admit that they feel ashamed. IN A NUTSHELL: A compelling, provocative and important documentary.